This low carb breakfast casserole is made with bacon, zucchini, onions and cheese! It’s easy to make and makes for easy breakfasts during the week. Just reheat and eat. Top with homemade ranch dressing and roasted tomatoes for an extra burst of flavor! How was your weekend? I hope it was great! Mine was. First, it was a three day weekend for me because I had Memorial Day off. Since Ken had it off too we went to our place in Lakeland on Friday and came back on Monday. In addition to enjoying three days off from work, we enjoyed time with family during a family dinner Sunday evening. I made brownies and street corn salad for the family dinner. The street corn salad was incredibly good so I might share the recipe on my blog one day. Our guests brought over fried chicken, deviled eggs, salad and cheesecake! I don’t eat fried chicken or cheesecake often so both were definitely a delicious treat! 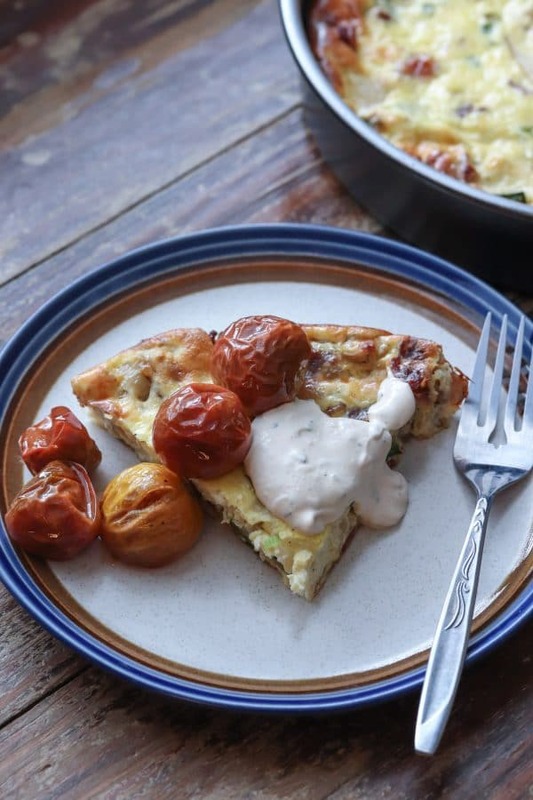 Inspiration for this low carb breakfast casserole comes from my love for quiches. Quiches are quite fantastic but lately I am shying away from flour crusts and I am limiting my carb intake. In fact, I haven’t had a “regular” quiche in quite some time! Frittatas are a great low carb option that that are easy to make. 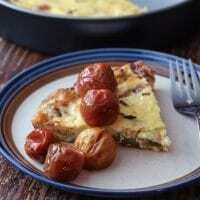 This low carb breakfast casserole is similar to a frittata in taste and texture; however, the cooking method differs. For example, a frittata is typically cooked in a skillet on the stovetop over low heat. 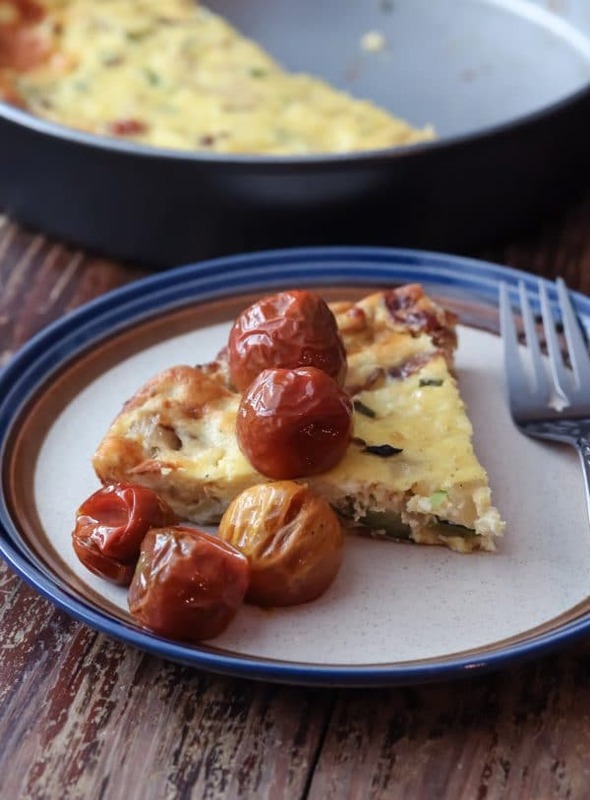 My low carb breakfast quiche is baked in a round baking pan at 375 degrees for 30 minutes. The baking method eliminates the need to be a frittata watchdog AKA standing over the stove watching it cook. I used pastured bacon and veggies from the farmers market in this low carb casserole. It’s packed with zucchini, onions and green onions. In addition, cottage cheese and full fat sour cream give the casserole a fluffy texture and creamy taste. This low carb breakfast casserole is made with bacon, zucchini, onions and cheese! It's easy to make and makes for easy breakfasts during the week. Just reheat and eat. Top with homemade ranch dressing and roasted tomatoes for an extra burst of flavor! Cook the bacon in a skillet over medium high heat. After the bacon is done cooking remove it from the skillet and place on a paper towel lined plate. Reserve the bacon fat. Place the sweet onion, green onion and zucchini into the skillet with the bacon fat. Cook for 5-7 minutes or until tender. Do not overcook - you don't want mushy zucchini! After the veggies are done cooking turn off the heat and remove the skillet from the heat. Mix the chopped bacon into the zucchini/onion mixture and pour into a 9 inch non-stick baking pan. If your pan isn't non-stick, grease it with butter or olive oil. Whisk together the egg, cottage cheese, sour cream and salt and pepper to taste. Pour the mixture into the baking pan over the zucchini/onion mixture. Mix together to incorporate and evenly distribute the zucchini/onion mixture. Cool for 10 minutes and then slice into 6 equal slices. NUTRITION: Calories: 173; Fat: 10g; Carb: 9g; Dietary Fiber: 2g; Net Carb: 7g; Protein: 11g Nutrition information calculated using My Fitness Pal and is an estimate. These calculations include the broccoli. Here is a link to the recipe in My Fitness Pal for your reference. Low Barb Breakfast Casserole. Who doesn’t love a low carb breakfast, right? It’s a great way to kick start the day! Thank you, I am always looking for low-carb recipes. My sweet husband has just retired and I have him on a strict diet to get and keep him health so that we can enjoy many happy years of retirement together. I’ll be giving this a try. Sounds delicious! What is on top of the slice? Thank you! Roasted tomatoes and homemade ranch dressing. Oh yum! can’t wait to try this! Thanks for sharing the recipe with SYC. 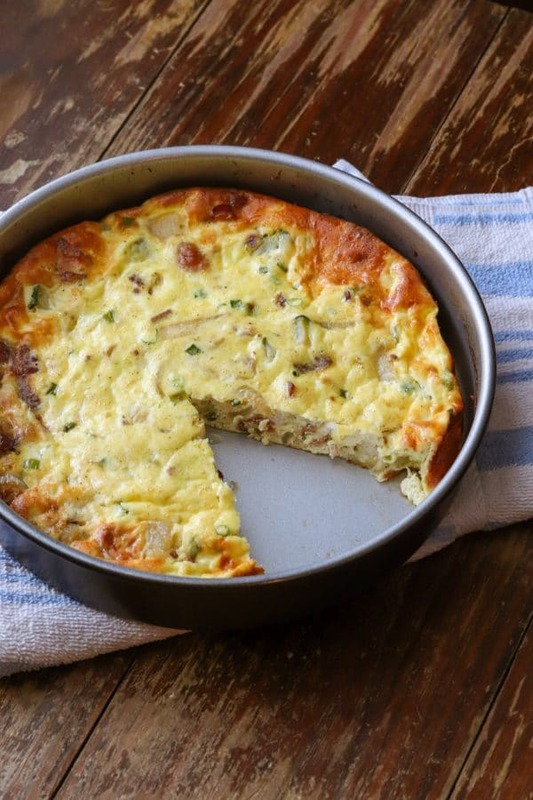 We love quiche and frittatas and often make them when I need a quick and easy meal. Thanks for sharing your recipe on Merry Monday. Pinned. 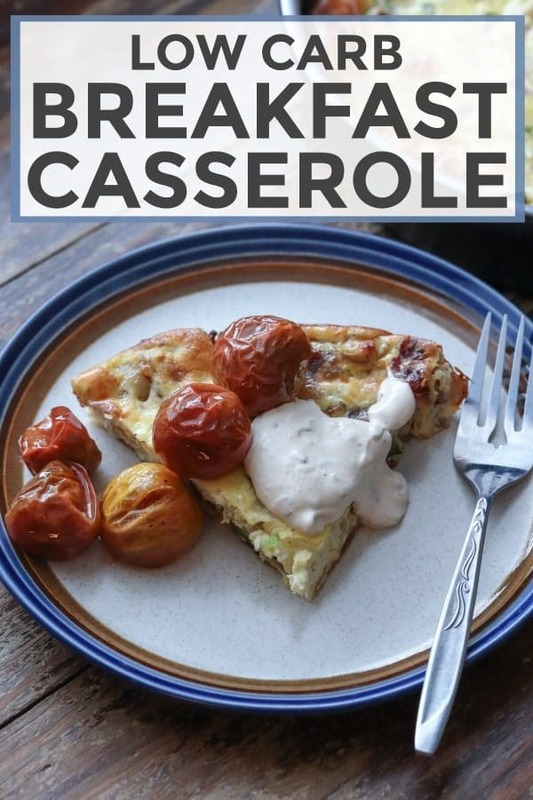 We love a breakfast casserole especially on weekends and this will be a perfect recipe to try! Hope you are having a great week and thanks so much for sharing with Full Plate Thursday! What a great way to start the day – especially low carb. I am always looking for low carb meals. Saving this one and I think I will make it this weekend when we go camping. Can’t wait to try this. Is there any reason NOT to use lower fat cottage cheese and sour cream (just cut some calories)? And would it be OK to use any lactose-free versions? It should be fine to use lower fat and lactose free. I typically use full fat because sometimes the lower fat versions contain additional ingredients.